Looking for a great NFL Playoff Game dinner idea? I had the pleasure of trying this lovely soup at a football party last week, compliments of Barbara McCrum. It was really delicious. I know I went back for seconds! Barbara served the soup with an arugula salad with toasted marcone almonds and crumbled goat cheese tossed in vinaigrette. 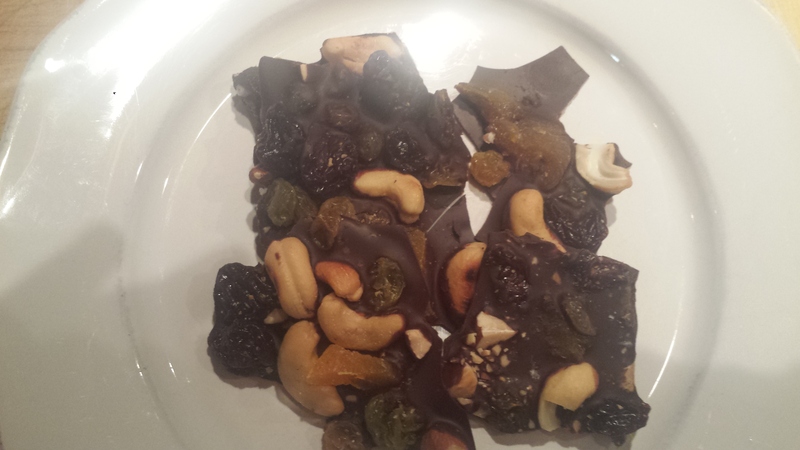 To top it off, Dawn O’Dell made the most decadent dark chocolate bark with coconut, dried fruit and sea salt. We were all licking every last bit of chocolate off our fingers, it was that good. I am off to Cuba this week so will not be in my kitchen, however, I am featuring Barbara and Dawn as my guest chefs today. Thank you Barbara and Dawn for sharing! The White Bean & Swiss Chard Soup is vegan, low fat and loaded with nutrients and protein. It is surprisingly creamy even though there is no milk or cream (due to pureeing some of the beans). You can substitute any dark leafy green for the swiss chard. The chocolate bark is also vegan and using a 70% chocolate makes it super rich in antioxidants and considered a superfood. The nuts and fruits add good oils plus vitamins and minerals, so this is a yummy dessert you can feel good about eating! Heat the oil in a large, heavy pot over medium heat. Add the leeks, onion, garlic and bay leaf along with a heavy pinch of salt and cook, stirring now and then, until softened but not browned, 10 minutes. Add the vegetable stock and the beans to the pot and turn up the heat. Once the soup comes to a boil, lower the heat and simmer until everything has completely softened and the soup is wonderfully fragrant, about 20 minutes. Remove and discard the bay leaf. Carefully puree 2 cups of the soup in a blender or food processor and return it to the pot. Add the swiss chard and cook over medium high heat just until they’ve wilted, about 3 minutes. Season the soup with salt and pepper to taste. Serve with a fresh tossed salad. Bring a small pot of water to a boil, then lower to a simmer. Put the chocolate in a glass or stainless steel bowl and set it over the pot of water. Stir the chocolate until it’s completely melted and immediately pour it onto the prepared pan. Evenly sprinkle the rest of the ingredients over the chocolate. Put the pan in the freezer until the chocolate sets, about 15 minutes. Break the chocolate into pieces and eat immediately, or store at room temperature in an airtight container if your house is cool or in the refrigerator if its summertime. 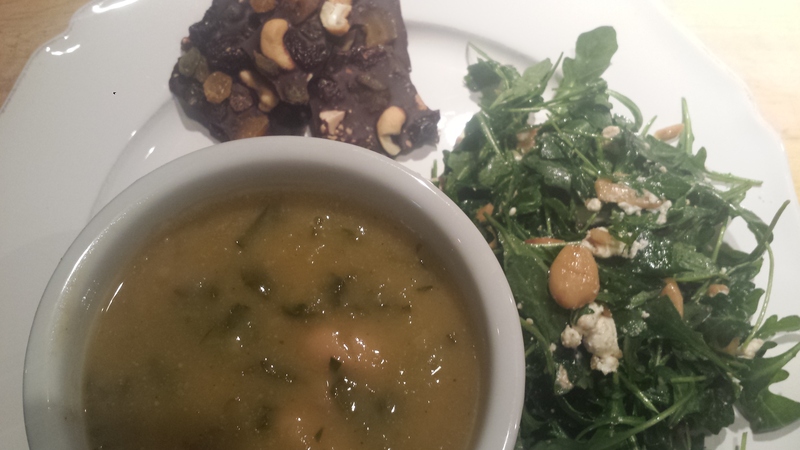 This entry was posted in All Recipes, Desserts, Meatless Monday, Vegan, vegetarian, Wheatless Wednesday and tagged Coconut, Coconut Bark, Dark Chocolate, Dark Chocolate Bark, gluten free, Gwyneth Paltrow, Vegan, vegetarian, Wheat Free, White Bean & Swiss Chard Soup, White Bean Soup. Bookmark the permalink. 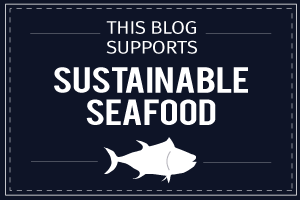 Pingback: community supported agriculture: week 3.